Being the leading country of the region in terms of information and communication technologies, Azerbaijan is currently engaged in the development of the new techno park of innovative orientation. Azerbaijan and Iran, the two neighboring countries enjoying well-established relations, intend to further expand their cooperation in the sphere of information and communications technology (ICT). The partnership between the state and the private sectors should be emphasized when implementing the action plan for the development of broadband Internet access in Azerbaijan, Chairman of the Azerbaijan Internet community Galib Gurbanov. Azerbaijan is one of the leading countries in the development of the ICT sector in the region as well as among the neighboring European states, Head of the EU delegation to Azerbaijan Roland Kobia said. Azerbaijan is considering the establishment of a joint venture for the production of fiber-optic communication lines with Austria, Deputy Minister of Communications and Information Technologies Elmir Velizade said on July 3. Azerbaijan's Ministry of Communications and Information Technologies jointly with ASAN Service, which ensures unified and coordinated provision of services by government agencies, is drafting a bill "On state information systems and resources". A regional information security center will be established in Azerbaijan, Communications and Information Technologies Minister Ali Abbasov said on Tuesday at a meeting with students and faculty of the Baku High Oil School. 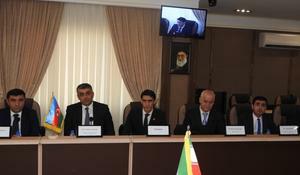 The Iranian embassy in Azerbaijan will assist to strengthen the relations between Azerbaijan and Iran in the field of information and communication technologies, Iranian Ambassador to Azerbaijan Mohsen Pakaein said on Saturday during a meeting with Azerbaijani Minister of Communications and Information Technologies Ali Abbasov.